Two Cents:Everyday Battle of "Procrastiworking"
If you found yourself reading this post, congratulations! You're one heck of a "procrastiworker". I value your time and fast internet connection so just a quick introduction about myself. My name is Joy Marie, but please call me Juya. 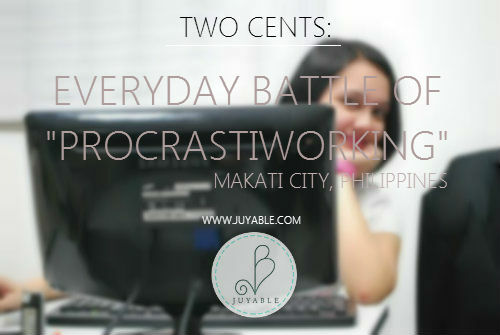 I am a technical recruiter by night and 24/7 Momtrepreneur (Working Mom slash Business Woman), the owner of Juyable. Frustrated singer and comedian, loves the color yellow, lives in a fictional world with her fictional "TV series" friends, 99% narcissist and a certified "procrastiworker". So what really is "procrastiworking"? I first knew this term from Jessica Hische, an American letterer, illustrator, and type designer, when I attended Graphika Manila 2014. Procrastiworking is the work you find yourself doing instead of the work you should be doing. Her philosophy is that we should pay attention to the things we do when procrastinating: those are the things we should probably be doing for a living because we actually enjoy them the most. Just a heads up, I love reading blogs. From news, fashion, entertainment, travel, food, humor, random and anything and everything under the sun blogs, name it and I would love to read those. It took me a while to create my own for various reasons and excuses, but hey, it's not too late, right? My life partner, Rickson Chew once said, "It's not about the likes nor the shares, it is how I create things that I am happy about". True enough, you owe yourself that sense of fulfillment. If someone appreciates your work or maybe criticize it, congratulations, you are loved so be grateful. Positive or negative criticisms will help you become better at what you do. I want to have that sense of fulfillment as well, so here I am, sharing my experiences, two cents and random thoughts that might help you, inspire you, annoy you and touch you in any way. I'm really excited about this additional "procrastiwork" of mine. I have tons of things I'm passionate about that has been running and playing in my head right now. I don't know what to write first and where to start. There you go, my first dilemma. I assume there will be days that I have more than one entry and days I have none, so pardon me. You have been warned. 99% narcissist here, but hey, I don't have selfititis. Also, if you know where to buy "creative juice" please let me know. More about my "procrastiworks" soon. So sit back, relax, read, enjoy and welcome to my world.